Egypt and Art > Tour Map of Egypt > Tour Aswan Directory > The Unfinished Obelisk. This obelisk, had it been finished would have been the largest ever erected. It is 118 feet long, and would have weighed over 1320 tons. 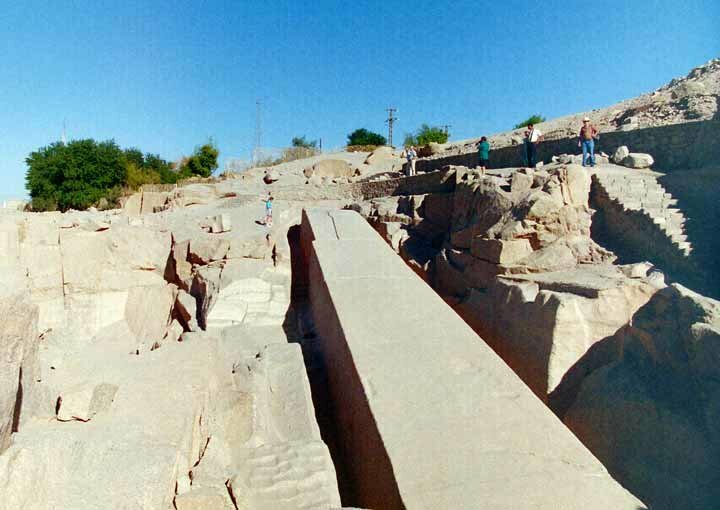 It is carved of the finest Aswan granite, but a crack in the stone caused it’s construction to be abandoned. It does shed light on how these monuments were made. They were carved on three sides and then they were cut lose from the quarry. It is still a mystery how the ancients transported these huge blocks of stone. Also lost in time is the method used to raise them to a standing position.